enjoyed bargain shopping and gifting to others. When she was relaxing at home, she liked watching Young and the Restless. Stella Rose was a devoted and active member of the Secular Order of Discalced Carmelites, Thunder Bay community. She was received into the order in November 2006 and made her final promises in January 2012. Stella Rose will be deeply missed by her sisters and brothers in the order. Stella Rose also was passionate to share her knowledge of her Anishnabe culture. While she worked with Indian Affairs Canada in Thunder Bay, Stella Rose fulfilled a role as office elder. One of her accomplishments was establishing a cultural room for employees, where they can practice, share and further their knowledge. 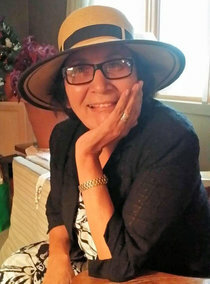 As the Manitou Gaming came to life, she continued to teach, share and host cultural activities. This room serves as a testament to Stella Rose. Predeceased by husband Paul Hogan. and Buck Neshkiwe (Nicole Hare). My condolences to Stella Roses family . She will be missed by so many . She was a good friend to me since she moved back here . I will miss talking to her at the Manitowaning Rummage sales . God bless .Hugs . Prayers to her family . Dorothy Hudson . Sad to hear of her passing, she was very nice to talk to whenever I seen her, my condolences to her family, will be missed. I never got the chance to meet her, but I'm convinced that she was greatly lovedand will be greatly missed ! May you soar with Eagle wings and live eternally with the Great Spirit and who have traveled there before you! My Condolences to Stella Rose's family. I worked with her at INAC for many years. She was a very kind person who lived an amazing life. She will be missed. My deepest condolences to the family of Stella Rose's. She will be missed by so many. I personally loved her stories. She always had a smile and was just happy and made everyone happy around her. Our family is sending you our love and hugs, Bucky and Glenna. We are forever grateful to have known your mom and we will always think of her and her beautiful presence with happy memories. She was a true blessing to our family. My deepest condolences to the family and friends of Stella Rose. Stella Rose shared so much of herself and her culture with those of us with differing heritage. Her kindness and teachings at the office will be forever remembered with gratitude and respect. My heart goes out to family and friends during this difficult time. So sad to hear of her passing on, gone is a friend, a happy cheerful lady, & I must say a classy one. Sadly we have lost another fluent Ojibwe speaker, her knowledge will be missed but not forgotten. Condolences to all her family, she's gone but will not be forgotten! Her memory will live on. Sending my deepest condolences to the family of Stella Rose. She was such a joy to know, listen to, work with and we all loved her. Her gentle spirit and loving heart was evidenced in everything she did. I shall miss you my friend, until we meet again.